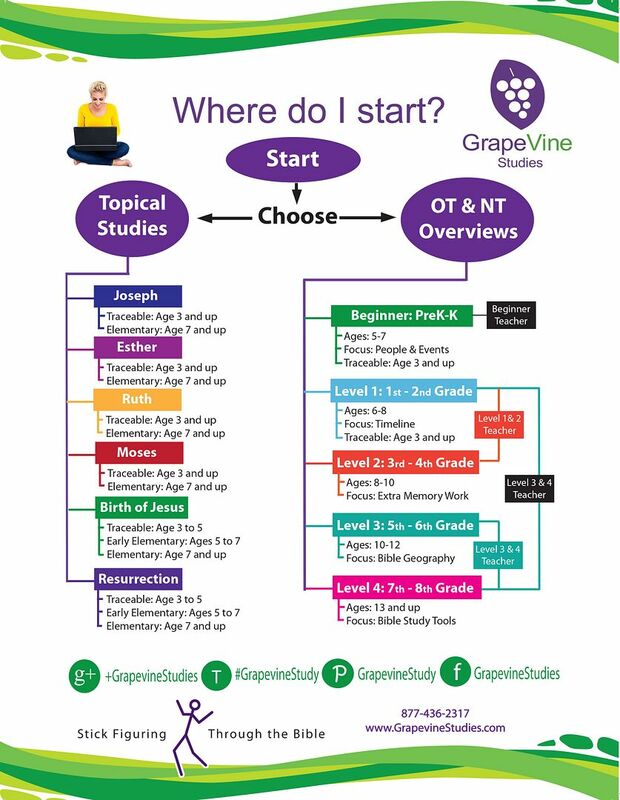 I love Bible study curricula, so being chosen for 2 levels of GrapeVine Studies was very exciting for me! 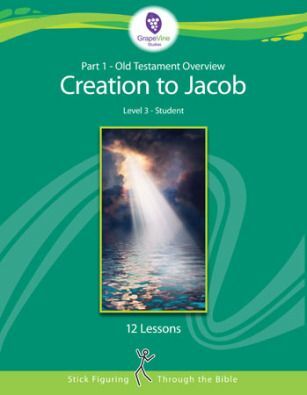 For this review, we were given a digital copy of Old Testament 1: Level 2 Creation to Jacob and Old Testament 1: Level 3 Creation to Jacob. Level 2 is intended for ages 8-10, while Level 3 is intended for ages 10-12. 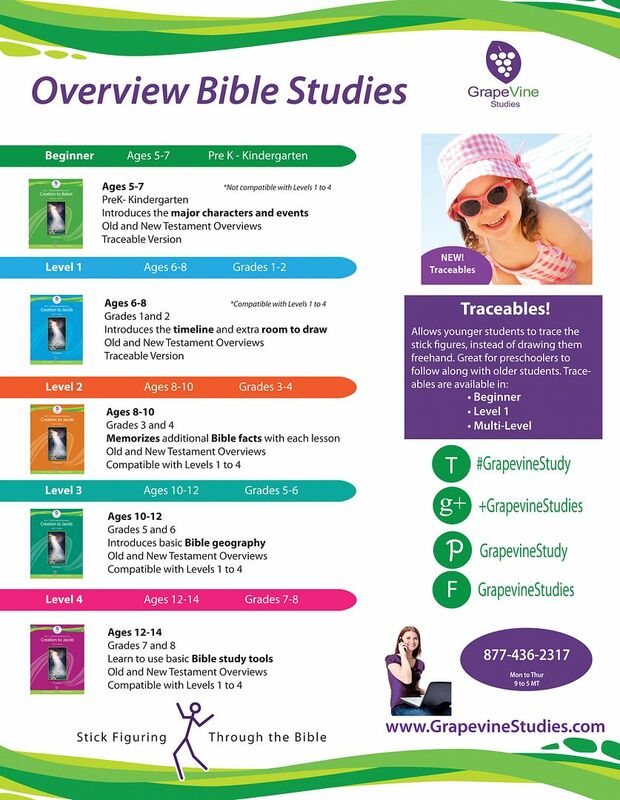 GrapeVine Studies Stick Figuring Through the Bible Creation to Jacob allows children to study the Bible in a fun way that reinforces memory and understanding. They cover the same material, the difference lies the amount of work in each level, with each level building on the previous one. So if you have children of differing ages, you can use different levels to study the same topics, with each student working as his or her own level. 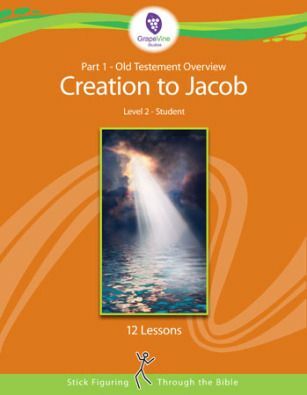 Level 2 is 45 daily lessons that give your children the ability to draw the Old Testament timeline, and understanding which books are the Books of Law vs. which are Books of History. Level 2 also incorporates memory verses. Level 3 also includes 45 daily lessons and stick figure drawing , but it adds geography and and important Bible facts. How We Used This: I wasn't really sure which level to choose for Mr. B since he was right on the border between the ages. Sometimes Autism lends itself to be a grade/age or two higher or lower, just depending on the product, so I was very appreciative of the offer or trying out BOTH levels. I would also like to take a moment to say thank you to the vendor for being very helpful in answering any of my questions! I took both of these levels and had him do a lesson from each a couple of different times to determine how they differed, and how they could be used together. They can be used together with great ease! The Level 3 has more emphasis on writing, while the Level 2, for me anyway, emphasized oral narration to a greater degree. They both have the same questions, and the same lessons each day. So if you are on the borderline, like we are, either level will work just fine. With that said, once I figured this out, We did one lesson per day. On some days we did more writing with Level 3, on other days we stayed with Level 2 for more oral reciting. One thing I really, really like is the section review! The section review is comprised of a list of questions that go over what you have learned in the previous section. In the review, the levels differ a bit, but not so much that you can't use them together. For example, in the 1st section review, Level 2 had 3 additional questions that were not in Level 3. Here are two really great graphics to help you decide which level would be best suited for your family. Overall I really like this Bible study program for kids! GrapeVine has everything I've been looking for in a Bible study. It gives us flexibility, pencil and paper work, and questions to answer to make sure he's following along. The art aspect is really fun, and it helps him to remember what we have learned. It's really a neat spin on a multi-sensory approach since he has to physically apply what he's learning in a graphical manner. Please click the banner below if you would like to read reviews on the other levels offered, or more reviews on these levels!